After thoroughly dominating the first three ODIs, India were left clueless in the face of Trent Boult’s “10-over spell” to lose their first ODI on the tour. While the win in Hamilton was surely a confidence booster for the hosts, it brought a lot of first-hand problems of the visitors to the fore. The general funda of limited-overs cricket is if the competition doesn’t go in your favour, then the best chance to change the trend is to prepare conditions that skew the balance towards the bowlers. Remember Dharamsala 2017? In the absence of Virat Kohli, a depleted Sri Lanka saw a chance and their pacers, led by Suranga Lakmal, used swinging and seaming conditions to rip through the Indian batting line-up and eventually set up a seven-wicket rout to snap their 12-game losing streak in ODIs. At least, in Dharamsala, India had MS Dhoni who brought in all his experience to guide the hosts past 100 runs, and here in Hamilton, India didn’t even have a single Test regular in the top six to see out such a difficult situation. So one thing is now confirmed that if there is a slight bit of swing on offer, Indian batsmen are done. One thing to remember while facing quality swing bowling is to remember that it requires a lot of guesswork and even the most skilled batsmen rely on their instincts to gauge where the ball will end up. When someone takes the ball away, like Irfan Pathan and Zaheer Khan of the yore, a batsman often finds an imaginary region to strike the white ball, but Trent Boult was nipping the ball back in. To counter them, one had to rock back to give the ball sufficient potential energy to reach him. Then playing with a straight bat becomes easy. However, the Indians mostly relied on shuffling across the stumps after Shubman Gill used it from the word go. He was dismissed in the same manner and the prime reason behind Kedar Jadhav’s dismissal was the same. Basics are important while playing on such surfaces and India should be careful about that from now. After the last game, in the same section, I wrote about how Ambati Rayudu and Dinesh Karthik’s innings would be the takeaway from the series for Virat Kohli who went for a mini break to manage his workload. However, the problem resurfaced once again and the duo threw away their wicket by two ridiculous shots today. While Ambati Rayudu played a nothing shot away from his body to be caught by Martin Guptill at short cover, Dinesh Karthik gave a simple catch to the wicket-keeper, making sure the old problem of we-don’t-score-runs-if-top-three-fails coming to haunt the Indian team once again. There are just six matches left before the World Cup and thanks to the superiority of the top three, India failed to see most of their middle-order batsmen's capability. Kedar Jadhav prospers when he is in the company of MS Dhoni, but at other times, he shuffles across the stumps like he would outdo VVS Laxman or Greg Chappell in playing flick shots. One of the major reasons behind India scripting success in flat batting conditions is the ability to deny the bowlers in the beginning and carry enough momentum in the middle to take the challenge of scoring heavy runs in the death. In this challenging surface, neither of the three, Rayudu, Karthik and Jadhav, tried doing anything that MS Dhoni did in that match against Sri Lanka. Responsibility should be the keyword just before the world cup, but it seems, Indian batsmen still need some coaching class. It has just been a tad more than a year that New Zealand made a limited-overs tour to India and honestly there hasn’t been any radical transformation in both the teams that India wouldn’t understand them. 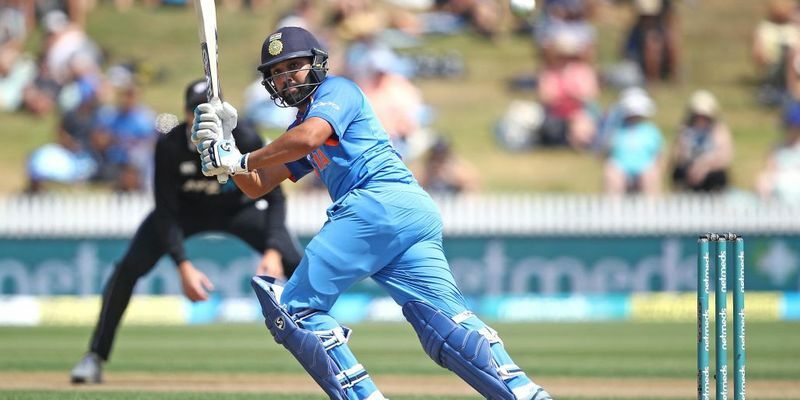 Rohit Sharma, in particular, has always struggled against the left-arm option of Trent Boult while right-armer Tim Southee has dominated Shikhar Dhawan regularly. So when the battle began, a mini-narrative was right out there and given the fact that left-arm pacers force him to open his stance to take a full view of the angle, Rohit struggles and Boult had a plan in front of him in the small stadia in the Kiwiland. To understand Rohit’s struggle against left-arm pacers, it would be wise to go back in time a bit. Mohammad Amir in the Champions Trophy final in 2017, Jason Behrendorff in Guwahati T20I in 2017, and Trent Boult in Mumbai 2017 made him suffer to no end with sharp in-duckers. So, he started using the tactics of attacking them straight away to put the pressure back on the bowlers, but today, the wicket was not conducive for stroke play and the white ball was moving like a red ball. Boult kept the ball low to take the hook and mini pull shots away from the equation, thus forcing the stand-in Indian skipper to go for shots on the pads. It eventually caught him off guard and as one delivery returned straight, it was safely gobbled up by Boult on the follow through. The struggle continues.